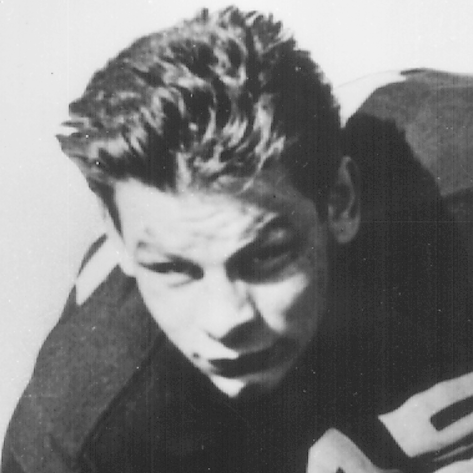 An All-State lineman at Detroit’s Northeastern High School, Szymanski anchored the line for Frank Leahy’s 1943 Notre Dame team, playing center on offense and linebacker on defense. Returning from service in the Navy’s aviation program, Szymanski re-enrolled at Notre Dame in 1944 the week of the Army game. And although he had not played football in nearly two seasons, he played 58 minutes in that contest, and 173 of 180 minutes in the Irish’s last three games of the schedule. The Detroit Lions’ No. 1 draft choice in 1945, Szymanski played five years in the NFL, including center on the Philadelphia Eagles’ 1948 world champions. Szymanski served as Probate Court judge in Detroit from 1959 until his death in 1987. Whenever old-time sports buffs recapitulate on the golden era of college and professional football, they think of gritty two-way performers laboring on the gridiron for 60-minutes unless their team was so far ahead, or so decisively beaten, that their coach gave them a breather. They relive the years when there was no such thing as “turf toe” and players went to work in pain. They dwell on the days when the old “college try” meant something, or the years when there were no professional player agents. When such reflections gain momentum, the old-timers smile when they think of genuine players like Frank Szymanski, a product of rugged prep football in Detroit, a disciple of the University of Notre Dame, and an artifact of the National Football League. Legends like Szymanski had no television networks, press agents or mass media coverage to spread the word of their skills from coast-to-coast. They simply went to work, did their job, enjoyed what they did and took pride in their achievements. And the pay for pro athletes was much more sensible than it is today. They were a unique clan, these old-time football warriors of a half century ago. Szymanski was a hard-bitten football player who earned his laurels with a persevering penchant for the game. He had talent, too. He was good in baseball and basketball, but, ah, it was football where he excelled. For starters, Szymanski was a versatile athlete on his high school team at Detroit Northeastern. He first became an All-City player as a guard, compliments of the Detroit News and the Detroit Free Press. That was in 1940, one year before World War II erupted with the bombing of Pearl Harbor. Then the now defunct Detroit Times tapped him for All-City honors as a fullback. Finally, he was selection as a tackle on the Free Press All-State team. All-City or All-State at three different positions is not bad for a high school kid trying to enroll in a college. He lettered for the Fighting Irish in 1943 and 1944. He had a brief stint in the military and was assigned to the Naval Pre-flight School at St. Mary’s, California, when rheumatic fever forced a medical discharge. 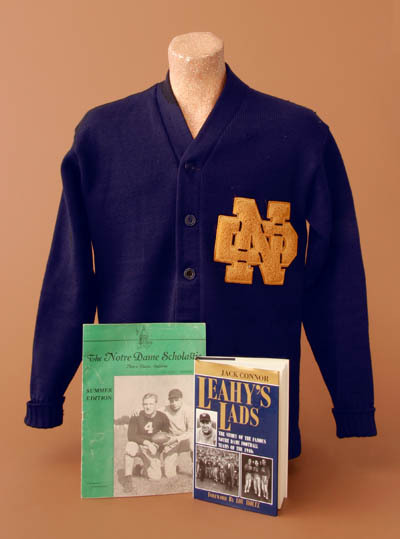 Coach Frank Leahy’s Notre Dame squad honed a 9-1 record in ’43 with Szymanski working the pivot. The team’s lone loss was a 19-14 setback at the hands of a powerful Great Lakes, Illinois, aggregation that was well stacked with college and pro stars who were pulling their duty in the military in WWII. The Irish rolled to the national championship despite the one loss, mustering 340 points along the way while allowing 69 with a stingy defense. Szymanski was a keystone on both sides of the ball. His drive blocking opened gaping holes for Note Dame’s vaunted running attack and his leathery play at linebacker withstood enemy assaults time and time again. Szymanski was in the Navy’s aviation program when Notre Dame kicked off the ’44 season. The Irish, as defending national champions, forged an 8-2 record, but it took an embarrassing defeat at the hands of Navy to wake up the echoes on the Notre Dame campus. Navy, like Army, was a national football power in the ’40s, thanks to military academies that were more attractive to athletes five decades ago. The Middies bombed the Notre Dame squad 32-13. Army was next on the schedule. The Irish hopes were bolstered tremendously when it was announced that Szymanski would rejoin the football team after his medical discharge from the Navy. Army was loaded for bear in ’44, led by the All-American twin terrors Glen Davis and Felix “Doc” Blanchard, Mr. Outside and Mr. Inside of college football respectively. The Cadets marched over Notre Dame 59-10 enroute to the national championship. It was the last time the Irish lost a football game during the season, its 8-2 record good enough for ninth place in the final balloting. The lopsided Army victory aside, Szymanski was the toast of South Bend. He had not played a college game since the sensational ’43 season, enrolled in school the week of the Army game and played 58 minutes of the melee. He was to toil at center and linebacker for 173 minutes of the 180 minutes total in Notre Dame’s final three games: Army, Northwestern, and Georgia Tech. He was an inspiration to his younger teammates. It was easy when it came time for the Notre Dame players to select their team captain for 1945, a most prestigious honor to behold. Then things happened. It was discovered that Szymanski has signed a contract in January of ’45 with the Chicago Bears of the National Football League. Szymanski was convinced that the contract wasn’t to become effective until after the college football season. The contract subsequently was declared null and void by the NFL because the Notre Dame star wasn’t a free agent. He had one more year of college eligibility after the 1945 season. Szymanski could have stayed and fought the touchy situation, but he chose to resign the captaincy to avoid embarrassment to the university he loved and admired. But he was not through with his football playing days. He was the No.1 draft choice of the Detroit Lions and played for the Motor City franchise from 1945 through 1947. He was honored on “Szymanski Day” Nov. 15, 1947 at historic Briggs Stadium. He had brief flings with the Green Bay Packers and Philadelphia Eagles and in 1949 performed in the famous College All-Star game in Chicago as a member of the Eagles. His pro football career ended in 1949 when he played briefly for the Chicago Bears. After his playing career ended, Szymanski was elected to the board of directors of the Detroit Chapter of the National Football Foundation and Hall of Fame for a two-year term in 1970. He was active in the Detroit Lions Alumni from 1948-1980. He helped form the National Football League Alumni Association in 1968. Its purpose was to render assistance to indigent former pro players. He was a first vice-president of the organization from 1968 to 1972, and then served on the association’s board of directors and legal committee. Szymanski was appointed auditor general of Michigan by Governor G. Mennen Williams in 1956, was elected to the post later in the same year and re-elected in 1958. Szymanski’s career turned to the judicial process in 1959 when he was appointed to fill a vacancy as a probate judge of Wayne County. He won election the next time around and was re-elected probate judge each term until his death in 1987. Szymanski was born July 6, 1924 in his beloved Detroit. He married the former Lillian Mikula in 1947. The couple has six sons and one daughter.